Document shredding services in communities around the country have gained popularity in recent years as identity theft has grown exponentially as a money-making venture in the criminal underworld. In the past, organizations and businesses would treat documents – even sensitive ones – with a casual disregard. Often documents such as old credit card receipts, tax and payroll records, invoices and other business documentation would be routinely discarded in the trash or left to gather dust in an unsecured storeroom or closet instead of going to a document shredding service. Today, many of those documents are worth money to the wrong people. Even documents containing information that doesn’t immediately come to mind as valuable could be highly attractive to your business competition, for example. Information such as confidential research, marketing strategies, patent information and trade secrets, even old emails are all targets for unscrupulous competitors rummaging through trash bins. Think this is far-fetched? A court ruling has determined that it is not illegal to take something once it’s discarded. That means any records you dump in the trash are fair game. All the more reason to have any documents you want to discard go to document shredding services such as Data Destruction Services LLC. Why bother with a professional document shredding service? Because it’s safer, more reliable, and more cost-efficient than attempting to handle document shredding yourself. 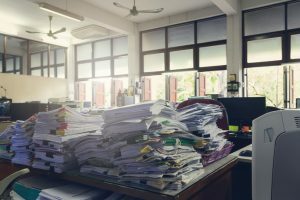 Assigning employees to spend time regularly shredding documents is risky and wasteful, tying up valuable human resources that could be used for more valuable tasks. We provide comprehensive document shredding services for communities in central and eastern Massachusetts as well as southern New Hampshire. And when we say “documents” we’re not just talking about paper – we also shred computer disks, storage tapes, hard drives and other electronic data storage devices. We can render anything containing important or sensitive information useless. For more information about safe, effective, and timely document shredding services contact the document shredding services experts here at Data Destruction Services, LLC. Don’t waste time and money! Let us help! Why risk trouble with spotty, inefficient, in-house shredding? Inexperienced and untrained employees often do a poor or incomplete job, exposing your firm to possible legal action and financial loss. Save time and money by having your data safely destroyed by the experts – Data Destruction Services, LLC.